Last Sunday, October 24th, over at Phindy's PCP site, was the big kick off to the week long party. They started with a Cardathon, what's that you ask, well it's a online live cardmaking crop class/ tutorial. The host showes you step by step how to make a card with photos and all you have to do is follow along and keep refreshing your browser to see the next step. Of course you also chit chat about other things along the way and have fun, fun, fun. 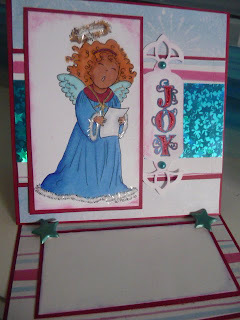 This is another card that will be entered into Phindy's Place challenge blog. I am glad you played along with the Cardathon and made this lovely easel card. Your little angel is so pretty with her sparkly trim and I love how you have made your sentiment. Thanks for joining us at Phindy's Place. Denise, you did a great job on your cardathon card! I just love the sparkly trim on her gown and her glorious auburn hair. Very pretty touches everywhere! Cute as can be! Love this sweet little angel. Thank you for joining us this week for the PhindysPlace challenge!